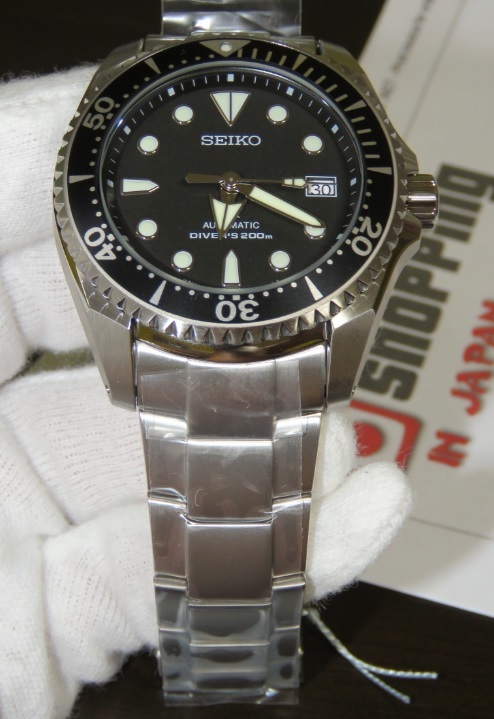 Price down now on this Seiko Prospex SBDC029 Shogun that comes with 200m for diver, Unidirectional rotating titanium bezel and 6R15 movement and has Titanium case & bracelet with the scratch proof finish. This Prospex SBDC029j is a JDM (Japanese Domestic Market) watch model and it's now in our stock - ready to ship within 48 hours to any country. So buy now before it’s too late! The perfect Shopping in Japan service. Amazing watch. The accuracy of the walk + 2s / per day! Great! This is a "gun" watch, meaning a fabulous, cool, lightweight, tough, and a daily wearer. Must be the equivalent of an old school reasonably priced strong Japanese 60s and 70s camera. Looks fantastic in any mirror looking back at the wearer. Classic looks, great accuracy, light enough not to intrude at any time. The lume is superb and the depth of overall quality shows all the time. Shopping in Japan is a recommended online retailer. The watch looks much better in real life ! Nothing is perfect, no watch is perfect, but some come satisfyingly close. Very comfortable, due to the light weight (lighter than many Swiss Ti watches), superb lume and a good aesthetic. Bracelet is a touch fiddly to adjust (watch out for those tiny tiny pin collars) and a bit rattly compared to some more premium brands BUT this watch may result in the rest of your collection gathering dust as it's just so wearable. 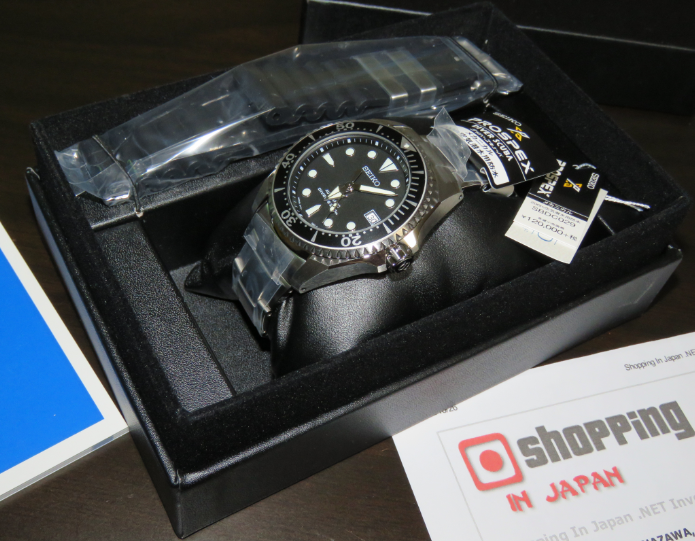 I am very happy to get the Seiko Shogun sbdc029. It is a fantastic watch. I also am very pleased from the excellent work ,cooperation and respond of the "Shopping in Japan" company. It is very reliable to do business with. Congratulations to its persolel. This is my everyday watch now. It's so lite that I forget it's on my wrist. The workmanship is excellent. The seiko "shogun" sbdc029 is just a great dive watch, for sure one of the best and maybe the best (and i am purchasing dive watches since 15 years now !) But I think a few people are aware of that because this watch looks much better in real than in any photos. Some elements make it look like an Omega seamaster, some others make it look like a Rolex submariner and yet it has its own style. Great sheaping from shoppin in japan. Thanks again ! Hello there! I just receive the watch. Is every thing like they said. The shipping, the watch itself and delivery all 5 stars. The watch is so light. I believe is a little bit more light then another titanium watch i ve got. Must be the latest version of titanium with diashield. Anyway i am happy with what i paid. Is worth it. This watch lives up to all the praise given by other users. It is extremely light and an accurate time keeper. I'm so pleased that I have finally purchased a watch that is so comfortable to wear and I forget that I even have a watch on. The only difficulty was sizing the watch as it has a two-part pin but using a ball-point pen to hold the sleeve in while the main pin is pressed home was the best solution for me. I think Seiko should include extensive instructions on how to remove links as each of my Seiko's have a different method. Aside from that it is a great watch. This is my third Seiko and second from SiJ and I would certainly recommend the company to others. Merry Christmas. Super wearable, well finished, accurate, mechanical, handsome, affordable - what more do you need in a watch? Subtly quirky submariner homage with the benefits of titanium. In many ways the perfect watch, at least for me. Looks even better in the flesh than in photos, and better on the arm than in the box, which is how it should be. Purchase & shipping process went seamlessly, big thumbs up to Shopping In Japan. If I ever need another watch, which I may well not, they'll be my first choice. I was amazed by the accuracy of this watch, it kept time with less than 1 second fast in three days. Also the power reserve exceeds the 50 hours. Since the entire watch is made from Titanium it wears light and comfortable and looks like stainless steel. I bought this watch for my birthday and Mina or Sara giftwrapped the box for me and was delivered exactly on the date, thank you both. Also the Seiko chopsticks were a nice present. Will buy from you again, this was my second purchase and thank you for such a stirling service. Watch is spectacular. Wear it all day long. This titanium watch is super comfy and light weight to wear. Craftmanship is spectacular. Arrived on time and in original packaging. Love Seiko watch. SIJ offers the lowest price on the internet. Thanks. Shopping experience with SIJ is awesome and worry free. Excellent communication.